After a big spike in first-quarter hiring, the direct and digital jobs market is now expected to improve modestly in the second quarter of 2012, according to the Bernhart Associates' Quarterly Employment Report: One-half of employers surveyed say they plan to add marketing staff over the next three months, while layoffs and hiring freezes are expected to decline. 50% of employers surveyed say they plan to add staff in the second quarter of 2012, down 2 percentage points from the 52% in the previous quarter. One year earlier, the index stood at 45%. 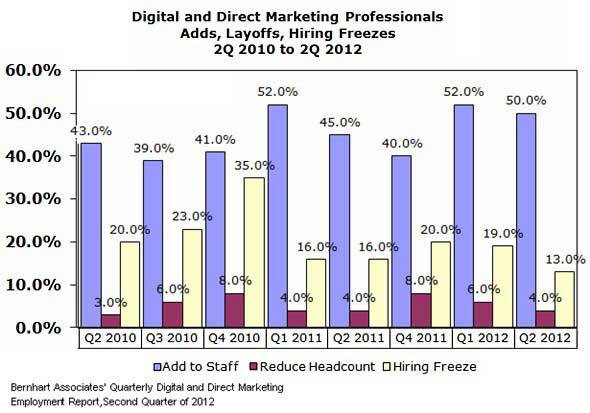 13% of employers how have a hiring freeze, down 6 points from the winter quarter. 4% of employers are planning layoffs in the second quarter, down from the 6% reported in the previous quarter. Below, additional findings from Bernhart Associates' Quarterly Digital and Direct Marketing Employment Report for the second quarter of 2012. B2C markets continue to lead the jobs recovery: 54% have plans to hire new marketing staff in 2Q12, compared with 47% of B2B employers (down from 48% in the previous quarter).